The intensive plant nursery, located in North Lincolnshire, England, will be the largest indoor farm in Europe, producing up to 420 tonnes of leafy greens per year across a growing area of 5120m2, arranged in racks rising to the height of 11m. Current, powered by GE and Jones Food Company Ltd., has announced that construction is underway toward building one of the world’s largest indoor farms. The intensive plant nursery, located in North Lincolnshire, England, will be the largest indoor farm in Europe, producing up to 420 tonnes of leafy greens per year across a growing area of 5120m2, arranged in racks rising to the height of 11m. 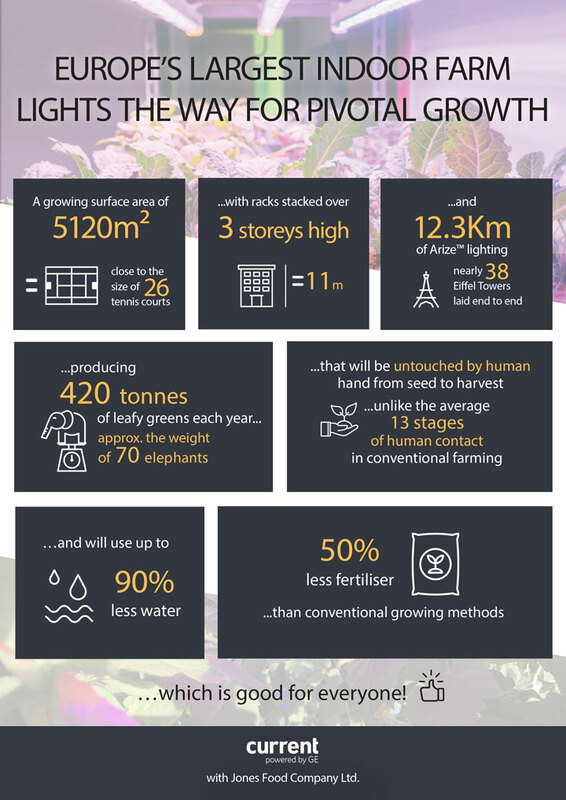 To maximize the facility’s yield, Current by GE is installing more than 12Km of its new Arize* LED horticultural lighting solution, with a balanced light spectrum that catalyses optimal growth in every plant and shortens the growth cycle for more intensive production. The equipment is housed within a futuristic, intelligent cleanroom (or “high-care”) environment that allows crops to be grown in complete isolation from external contamination – ideal for food production as well as growing high-quality cosmetic and pharmaceutical ingredients. Production of the first crop from the Jones Food Company operation is due to start in autumn 2018. With a growing area of 5120m2, the equivalent of 26 tennis courts, arranged across racks rising to a height of just over three storeys, the facility – owned and operated by JFC – will set new production and environmental standards for crop production of the future. With year-round local production JFC aims to slash food miles and produce leafy greens, herbs and other crops that can be delivered from harvest to plate in minimal time. In addition, by designing the farm as a “high-care” facility, JFC will also be able to cater to the growing demands of cosmetics and pharmaceutical customers who require reliable supplies of the highest quality, natural ingredients. Every factor in the growth of the crops produced will be highly controlled; from the nutrient solution delivered to the roots of each and every plant, to the concentration of CO2 in the room, to the light wavelengths and duration of the growing “day” and subsequent rest period. Thanks to intelligent automation and advanced robotics, every plant can be grown in ideal, cleanroom conditions, untouched by human hand from planting to harvest. By comparison, conventional production cycles typically average 13 stages of human contact. The Arize range of lighting solutions are low cost to install and maintain, with a market-leading 36K-hour lifetime (L90) and a five-year warranty to provide peace of mind and long-term reliability. An IP66, UL Wet rating also makes them ideal for high-care and cleanroom facilities as the luminaires can be easily washed and sanitised in-place. The JFC facility is designed to minimise the environmental impact of vertical farming, which will also offer a direct financial benefit to the company. For example, it will use up to 90 percent less water and 50 percent less fertiliser than conventional growing methods, saving on input costs. In addition, Current by GE’s Arize LED solutions are highly efficient, generating less heat than competitive products, reducing energy consumption and carbon footprint by 33 percent compared with vertical farming averages. Current is the digital engine for intelligent environments. A first-of-its-kind startup within the walls of GE (NYSE: GE), Current blends advanced LED technology with networked sensors and software to make commercial buildings, retail stores and industrial facilities more energy efficient & digitally productive. Backed by the power of Predix*, GE’s platform for the Industrial Internet, and a broad ecosystem of technology partners, Current is helping businesses and cities unlock hidden value and realize the potential of their environments. The nucleus of the Jones Food Company consists of three main protagonists: James Lloyd-Jones (CEO), Dr Paul Challinor (CTO) and Gary Thorneycroft (CFO). Together, they have consolidated initial ideas on improving the management of high value crops in intensive growing conditions by constructing a world class plant production unit based in the UK.